UP, DOWN: Extend or retract the arm of the vehicle. Z: Make the arm repair the roof. Make sure you're properly aligned with the roof. Level up after 200 points scored. A randomly chosen house will grow in size upon leveling up. Nice little game! Gets pretty challenging after a bit. I like the concept that you can't stop the attack, you can only deal with it by repairing. It's like a mini-game inside of Missile Command :) Once I get my PocketCHIP this will certainly be a great little time filler. Change the color of the roof. It's hard to tell the dark blue from the black night background. I had trouble seeing what I was supposed to do. Meteors could be a bit bigger? I didn't really see them until they really started moving and hit. Could be a cool effect to have them start small, then get bigger as they fall. And the more I play, the more I want the game to not end when I lose just one building. Maybe either have it so you lose when they're all gone, or some sort of quota per level and that quota gets lower as you progress levels. I was thinking about introducing perks. 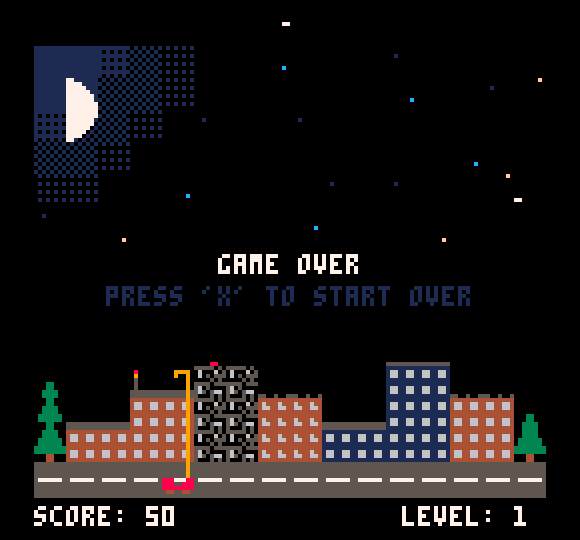 Upon completion of the level you could chose one of N perks and it would stay with you until the end of the game: Auto-repair unit on a building, so that you don't have to take care of it; double speed; toroidal level (exit left, arrive right, and vice versa); auto-alignment to the roof level; and sturdy frame of the cart so that the arm doesn't need to retract in order to travel.